RV Tools is one of my favorite 3rd party tools for vSphere. If you are not familiar with PowerCLI this is a “MUST HAVE” for you. With this tool, you can get quite all the information you need from your VMWare environment. You can check all information from your VMs, ESX(i), vCenters, Clusters, vSwitchs and so on. RVTools is a windows .NET 2.0 application which uses the VI SDK to display information about your virtual machines and ESX hosts. Interacting with VirtualCenter 2.5, ESX Server 3.5, ESX Server 3i, VirtualCenter 4.x, ESX Server 4.x, VirtualCenter 5.0, VirtualCenter Appliance, ESX Server 5.0, VirtualCenter 5.1, ESX Server 5.1, VirtualCenter 5.5, ESX Server 5.5. RVTools is able to list information about VMs, CPU, Memory, Disks, Partitions, Network, Floppy drives, CD drives, Snapshots, VMware tools, Resource pools, Clusters, ESX hosts, HBAs, Nics, Switches, Ports, Distributed Switches, Distributed Ports, Service consoles, VM Kernels, Datastores, Multipath info and health checks. With RVTools you can disconnect the cd-rom or floppy drives from the virtual machines and RVTools is able to update the VMware Tools installed inside each virtual machine to the latest version. Normally I use the tool to make Excel extracts from the VMs to know which VM tools are outdated. An other nice feature that I use is the vDatastore tab. There I have a nice overview of all datastores to check free space, quantity of VMs and so on. There are a lot of nice features and information to use with this tool. Go ahead, install it and try it! If you like this tool as much as I do, you can also donate some money via paypal! VMWare recently released the new vSphere 6 “Suite”. Because of this, I would like to show you some (the most important for my use) of the new features and extensions. As usual the scalability is extended with each new release. With the new one, you can run up to 480 logical CPUs, 12TB of RAM and 1024 VMs. 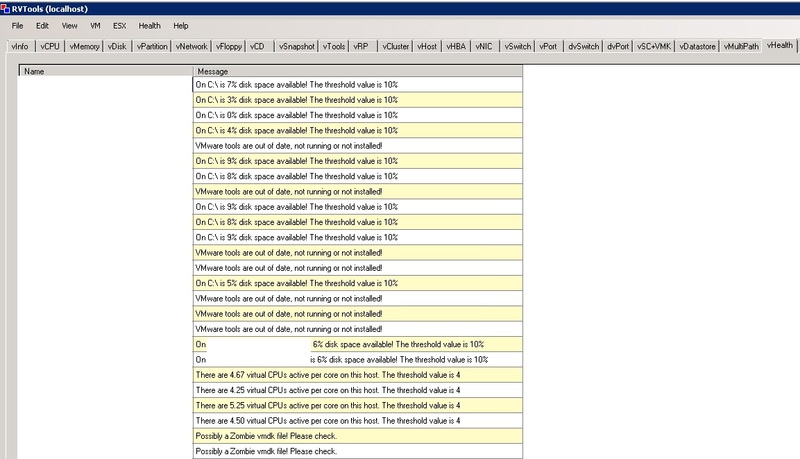 Now you can cluster up to 64 ESXi Hosts with a total of 8’000 virtual machines. There is a new advanced system setting to configure the password complexity for local user accounts. The new hardware version is 11 and supports up to 128 vCPUs and 4TB of RAM. The the new HW Version brings a new xHCI cotroller for USB 3.0 support. Support for Windows Server 2012 r2 Cluster has been added. The vCenter Installation was simplified. Now you have only two Modules whitch you can install separate: the Platform Services Controller (PSC) & the vCenter Management Server. The PSC includes the old vCenter SSO, licensing and certificate management. The vCenter Management Server includes the Inventory Service, WebClient and the vCenter which cannot be installed separate. For a quick install like Labs and so on, they use Postgres as the SQL database and no more the Microsoft SQL Express. vCenter can now be installed as an full supported Appliance with the same features as the Windows vCenter Server. The appliance is a Suse Server with a Postgres SQL database. You can also install it on an external Oracle database. The new Web Client design was changed and it looks now like the well know VIClient. The performance was also imense improved but you still need the Flash Player from Adobe. VMotion is getting more and more flexible: You can vMotion virtual machines across virtual switches, vCenter Server systems, and long distances of up to 150ms RTT. Fault Tolerance (FT) was completely rebuilt. With the new limitation of 4 CPUs and 64GB of RAM you can finally use FT for most of the Server. High Availability (HA) supports now also storage errors. My favorite feature with vCenter is the new “Multisite Content Library”. There you can save all your templates, scripts and ISO files you need for your vmware environment. So you just have to upload it up to this portal and everybody can use the files there. You don’t need anymore a Datastore where you have to upload the files. With Virtual Volumes, VMWare introduces a new way to manage Storage on your vSphere environment. You don’t have anymore the need of handling with a lot of LUNs. You can now use multiple TCP/IP stacks to configure to each a own gateway or routing tables. vSphere Network I/O control was also increased. You can now configure down the limits and reservations to each vmnic on every single virtual machine. As you see, we have a lot of nice new features to work with and a lot new things to learn. I will try to show you some of the new features in the next few weeks more detailed. This is a good preparation for upcoming migrations. If you need more information’s of the features have a look on the VMWare PDF what’s new. There you have a more detailed information about it. I did also used this document to write this post.